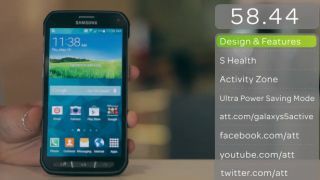 Update: Samsung has told TechRadar, "we do not have any specific plans for other markets at the moment", so looks like it's just the US getting sits hands on the Active for now. Well folks, despite our initial doubts, the Samsung Galaxy S5 Active is as real as real can be. Just hours after a bunch of new images were spilled, US carrier AT&T has just launched the rugged S5 variant, which adds shock resistance and a more robust dust-proof body on top of the flagship's existing waterproof feature. But the Active isn't cutting corners elsewhere. You'll still be getting that 5.1-inch AMOLED screen, 16-megapixel camera, and the fingerprint scanner. Samsung's also added an extra button to the side of the phone, which will take you to straight to all of your outdoorsy-type apps. AT&T is selling the handset for $199.99 (around £120/AU$215) on a two-year contract. We've asked Samsung about global availability and we'll let you know as soon as we hear more. But the question now is: do we actually need this phone? With the S5 flagship offering more protection against the elements than ever, an Active variant feels a little less necessary this time around. But if you're heading out for a spot of mountain climbing/jet skiing/sandboarding/extreme rollerblading, then you might be safer with the more rugged option. Just saying.